There’s a lot at stake for all players in Japan’s upcoming mid-term election. Another election already? Less than a year after Japan’s historic general election victory for the Democratic Party of Japan, it seems a bit early for the people to be voting again. After all, the country has only just installed a new prime minister. So is there really any need to pay attention to the upcoming upper house poll? The answer, of course, is yes. This is not just a mid-term election offering the people a chance to pass judgment on ten months of DPJ rule. If the DPJ is to maintain political stability and attempt to make progress with its reformist agenda, it needs to secure some kind of majority in the House of Councillors’ vote on July 11. Failure to do so will mean political uncertainty, potential legislative gridlock and an increased likelihood of the DPJ having to dissolve the lower house for elections before its current four-year period of office is up. This is because Japan’s upper house is relatively strong. Typically in bicameral parliaments, the second house can only delay the passage of legislation or bring attention to points of difficulty by amending bills. But in Japan, the lower house needs more than just a simple majority to override most bills rejected by the upper house. Instead, a two-thirds majority is required, and that’s a luxury the DPJ falls tantalizingly short of. Even if the government of the day does have a two-thirds majority in the lower house, the upper house can still disrupt the smooth-running of the legislative process in Japan’s Diet. This is what the Liberal Democratic Party found out after the then-opposition DPJ and its allies gained a razor-thin majority in the upper house in 2007, during the period of the ‘divided’ or ‘twisted’ Diet. While it looks likely that the DPJ will again win a plurality of the seats up for grabs this time round, it remains far from certain that it will be able to improve on its current position in the upper house and win the 60 seats it needs for an absolute majority. But both the DPJ and LDP will probably end up having to rely on cooperation from other much smaller parties to achieve their respective goals. 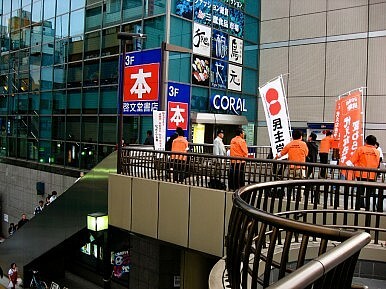 The DPJ will be particularly reluctant to have to continue relying on junior coalition partners since it has already sustained criticism for giving too much sway to the People’s New Party (on postal privatization backtracking and other issues) and the Social Democratic Party, (on the Futenma air base relocation issue—although this ultimately led to the party’s departure from the coalition). So stability is at stake for the DPJ and the nation, revenge for the LDP, and glory for all those leaders of minor parties with aspirations to be major players. Japan’s problems didn’t begin with the DPJ. If elections are to mean anything, a party needs a fair crack at the whip. Kan Needs to Attack LDPThrough Kan’s FingersLDP’s Pointless PosturingLDP Not Playing BallTanigaki: Political Martyr?